While Persian cats may typically be placid in nature, travelling can still prove to be a challenge. In general, cats do not enjoy travelling. As creatures of habit, they prefer the safety and familiarity of their home. But with adequate preparation, it is possible that you can learn how to travel effectively with your cat in spite of its behaviors and tendencies. The laid back personality, quiet, and friendly demeanor of Persian cats make them far more predisposed to travel than other types of cats. A Persian cat from Egypt recently survived a 3,400 mile ordeal travelling to London trapped inside her owner's suitcase. The ASPCA recommends maintaining your cat's routine as much as possible while travelling from feeding schedules to playtime. While cats are difficult to travel with, they also like to prove humans wrong and making adequate preparation might just give them the opportunity to do so. No matter what method your Persian is traveling by, it is always a good idea that your cat is micro-chipped and that chip is registered with Home Again (or similar registry) with all owner, veterinarian and other pertinent information so your cat can be successfully returned to you. Before heading to the airport, allow your cat to have a final bathroom break and ensure that all necessary paperwork is on hand. Research all of the airline policies and compare different airlines before booking your trip. It is in the best interest of your cat to be able to travel in the cabin with you. Inquire about medical requirements and fees. Check to ensure that you have a pet carrier that is approved by the airlines for travel. Having a good quality cat carrier will not only satisfy requirements but protect your pet as well. Ensure that your cat is equipped with identification tags that include all relevant information. Try to book flights that have the fewest stops to reduce stress on your cat. Also consider weather during layovers and how being exposed may affect your cat. Write in large characters "LIVE ANIMAL" on the side of your pet carrier and place a photo of your pet on the side. This will put handlers on alert and assist in finding your pet should it escape. 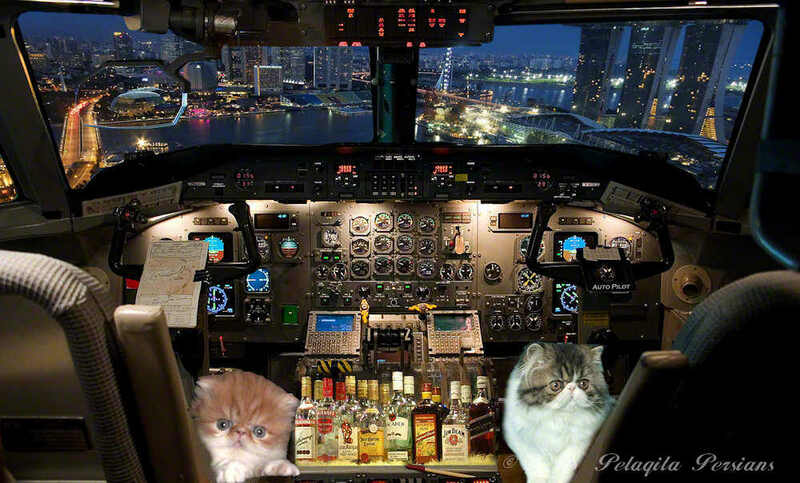 Remind the flight crew when you board the aircraft that your cat is onboard so that they remember to check on it. Feed your cat about 3-4 hours prior to departure to ensure that the food settles and doesn't cause motion sickness. Place blankets and toys inside the pet carrier that will give your cat the scents and comforts of home. Place the carrier in the vehicle where your cat can see you and ensure that it is secure. Offer food and water to your cat at its regular meal times. Make time for play as well. If you will be crossing into different time-zones, try to help your cat adjust well before the trip. Never leave your cat unattended for more than a few minutes inside the car regardless of the weather. Although bringing your friendly feline aboard a luxury ocean liner isn't quite as mainstream as car or airplane travel, at least one cruise line is offering cat lovers the opportunity to bring their beloved pet with them. Cruising with your pet is not as simple as you might think given the strict standards of cleanliness that cruise lines must adhere to along with the various local laws in the ports of call. But if you desire to board a cruise with your cat, Cunard has found a way to let you bring your furry friend aboard and treat them to a luxury vacation. Boarding your pet on a Cunard cruise is like checking your pet into a luxury floating hotel for cats where you can visit several times each day. In addition to spacious kennels and a full-time Kennel Master completely dedicated to the comfort of your pet, your cat will receive a complimentary gift set upon arrival that includes toys, a personalized name tag, a photograph with you, a food dish, and much more. Your cat will be treated to a comfortable bed and soft blankets along with freshly baked cat treats served at bed time. They get posts and scratchers along with their own litter boxes. Your cat will even have its own indoor playroom where it is given playtime several times a day either by itself or in the company of other cats. Best of all – your pet is never left unattended even overnight and there is someone caring for your cat 24 hours per day. There is indeed no better way for your cat to travel in style around the globe. While cruise ships may have more amenities than cars or airplanes, they do not have veterinarians. Be sure to consult with your vet prior to travel to determine if your cat is fit for travel and if it's the right time to bring your cat on a cruise. Most hotels maintain a pet policy and various fees to accompany it. Do your research before making any reservations. Make sure your cat is out of direct sunlight during road trips. Use a window shade for comfort. Prepare a travel kit especially for road trips that contains flea and worm treatments, first aid supplies, hand wipes, plastic bags, and any other comforts of home. Consider implanting your cat with a microchip for identification purposes in the event it gets lost.